To abide or not to abide, that is the question! In our contemporary church experience we have fallen into following habitual or traditional rules and been lulled to think that they equal full participation in Body life. Sunday morning Sunday Scholol and church, church again on Wed, Night. Give a tithe and go to a weekly Bible study. What else could God ask? Right? No, sorry, wrong! Way wrong! We are called to walk in The Spirit. We think of a “walk” as something that we do occasionally, but the Bible means something far greater. Our “walk” is our 24/7 life – all of it. All of it in The Spirit of Jesus. Jesus’ life in us, as us, through us. Not segregated or broken into parts, but so integrated that we are totally “leavened”. In a loaf of bread there is no part where the leaven isn’t. In the sea there is no place that the salt isn’t. So our lives are to be with The Spirit and His Lordship and direction. Jesus is Lord of all or He is not Lord at all. The world and most contemporary church members scoff at this idea. Jesus doesn’t scoff. He calls us to abide in Him. What does the word “abide”mean to you? Is it to visit occasionally? To pass by on the way to more important things? Think about it. The answer that you give yourself is the answer you will live by and your answer will have eternal consequences. Think about it. Eternity is a long time. To abide or not to abide, that is the questiion. Let’s start by a general discussion and definition of “calling”. Calling is often thought of as something that only happens when a Christian “surrenders” to the “call” to the professional ministry (i.e., to be a pastor, missionary, etc.). This is a cultural misunderstanding of the term. While it does apply to the offices within the Church (Apostle, Prophet, Evangelist, Pastor, Teacher – Eph 4:11), it is by no means limited to them. It may be that no other misunderstanding of God’s Truth has so handicapped the work of Christ and held back the Kingdom of God on the Earth. The fact is that EVERY believer is “called” to full time ministry in the Church. (Church = The Body of Christ) GOD DOES NOT CALL PART-TIME CHRISTIANS! In this sense “calling is destiny”. We each have a destiny or purpose in God. Each person is a unique design, specifically created to do very specific things that are intended to contribute to the completion of the wonderful Plan that God has had in His mind since before He created the Earth. (Eph 2:10) Every one of His children who respond to His offer of forgiveness and reconciliation in Jesus Christ is born again, not only to inherit eternal life with Him in heaven, but also to do meaningful and specific things in His Kingdom building on Earth. The true “calling” of God is to “Come, follow Me.” To follow Him in the work that He has set aside for each of us to do, to “run the race that is set before us. (Heb.12:1) Notice that He picks the race. He picks it and calls us to follow Him in it. Life’s greatest challenge is to find that purpose and live it out faithfully. Our greatest enemy is the Deceiver whose sole purpose in the life of a believer, since he can’t steal our salvation, is to obscure, deflect, discourage, or if possible, prevent our understanding God’s call and block the fruit that would be borne within it. Our call and the fruitfulness potential within it is only realized in the center of God’s will for us. This is at least true in the sense of maximum potential. God will use us even when we are not centered in His will but the fruit produced in any other place will never be all that it could be. That’s why the Deceiver works so hard to deflect us. If he can’t steal our salvation he will try to steal our fruit. And he will steal just as much as we allow him to, even causing some to end their race barren and beaten. The Deceiver offers his distractions in many forms. He knows our weaknesses in our flesh and he plays on them incessantly. His offerings always appear to be attractive, but they all have in common that they deflect us from God’s call and lead us on a different path. He often uses money, either the hope of getting some or the fear of losing some. God doesn’t make junk! He doesn’t make or design any person without specific purpose for that life. Each and every life is designed to fit perfectly into His Eternal Plan. He gives perfect gifts, talents, and abilities, while providing perfect training and preparation for each one to follow His calling and to participate in His plan. He will provide every thing each of us needs to fulfill His plan and calling in our lives. He must, or He is not the Sovereign God. God will meet every need of one living within His call. His calling is always accomplished within His order, never contrary to His Word, and always produces His fruit. Finding and fulfilling it will require faith (Heb 11:6). Finishing in it will require endurance (Heb. 10:36). It will require sacrifice and may fly-in-the-face of worldly wisdom or custom (Phil. 1:28,29 – I Cor.1:26). It is very possible that following God in His calling will not be the most financially rewarding thing that we could do. It very well might mean that some others will not appreciate us or what we do. We will be asked to walk by faith and not by sight (Habakkuk 2:4). No matter how it may appear to the flesh or the world, it is in the center of God’s will and in fulfilling His call that the highest fulfillment in life – the greatest peace, joy, and purpose – are found (I Peter 1:1-7). Our commitment to God’s calling will always be tested by adversity. Often it will be challenged to the very point of breaking, the point where there is nothing left to hold on to except the knowledge that God has called and is able (I Peter 5:8,9 – 4:19). There is a storeroom in Heaven where the forfeited rewards lost to those who have been deterred from pressing in to God’s calling rest, wasted to them forever, waiting to be passed to those who have faithfully persevered (Matt 25:28,29). God desperately wants us to know His will and to fulfill His calling! He does not play games with us or try to confuse us. When confusion comes it is not from God (I Cor.14:33, Romans 12:1,2 and II Chron. 16:9). Once we know our calling we can’t not do it and have peace (James 4:17). Sin destroys peace. Are we, you and I, “called” to be a part of C12? C12 is a business that is a ministry. God created C12. God has sustained C12. God has produced fruit through C12. Only God can do what has been done in C12. C12 is a vehicle for some to fulfill God’s call in their lives. Not all, but some. Those that God calls. C12 is a “for profit business for a specific reason that has little to do with making a profit, but everything to do with responding to God’s call to minister God’s Truth to a very specific part of His Body, business owners and CEOs. To operate in the realm they do, to play by the same rules, to feel the same pressures they feel, and to model God’s way in them all. We are imperfect men, leading imperfect men, trying to let God’s light shine in an imperfect world. To execute the plan and to take C12 into the future will require a team, a cadre, of “called” men. For over 40 years I have knowingly walked in my “calling”. In doing so, I have sacrificed nothing of meaning and have been richly blessed. It is my desire to commit the rest of my life to walking with, and helping, other “called” men. Some of them will be Chairs and some will be members, and some will be just men I come to know, but they will be “called” men. Are you one of them? The Whole Truth – In Kindle! Rising From the Ashes! Really! In I, Radical I make the statement that “I will always have all I need to do all God wants.” What He wants is His will in and for our lives. Over the years some have questioned such a bold and starightforward claim. I realize that it is bold but the fact is that it is based on two pillars; one fairly reliable, and the other totally certain. The “fairly reliable” pillar is the testimony of personal experience and that of many others. It has been my experience for over 40 years but that’s not a really long time and I’m not at the end of my race yet. God may leave me hanging out to dry and I may be shown to be a fool. But I’m not in the least bit worried about that. I have read the biographies of many others who have trusted God and their testimonies are amazingly consistent. People like Hudson Taylor, George Mueller, Mother Teresa, and Amy Charmichael all say the same thing – God provides for what God calls. We sometimes get confused between what we WANT and what God ASKS. He isn’t obligated to provide for any whim or fancy we might have and His ways are not like ours, but He is the Creator King of the Universe and nothing is beyond His ability to supply to those who are striving to do His will. An example of this principle is found in chapter 3 in I, Radical, the back-story of C12. It’s called “Rising From The Ashes.” Along with several others I share the story of how God carried our business through an arson that wiped out our office and laboratory at a time when our company had no insurance and no ability to borrow. Someone squirted gasoline under our front door and torched us. It looked like that was the end of the dream of having a business that would honor God for sure…and yet… it wasn’t! In the mid-seventies with no insurance and no credit and interest rates at 20% and stag-flation and 10% unemplyement, we not only survived but lived a miracle. It’s a great story, get a copy of I, Radical and check it out. The Story of a radical God’s work through an ordinary man. Buck Jacobs, founder of C12 is has published a new book titled "I, Radical" that talks about his own radical journey in life. 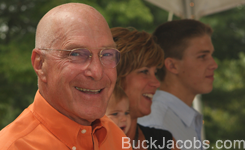 Buck Jacobs, Chairman and Founder of The C12 Group, LLC - Christian CEO and mentor. Buck has an extensive background in successful organizational development based on the principles found in scripture. The motto of the C12 group is "Building great companies for a greater purpose."